Westbound SE Harney Street. 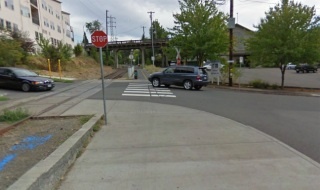 ODOT says stop signs are needed on the path because they’re worried vehicle users on streets like this will wait on railroad tracks for path users to cross. 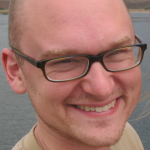 You can thank the ODOT Rail Division. 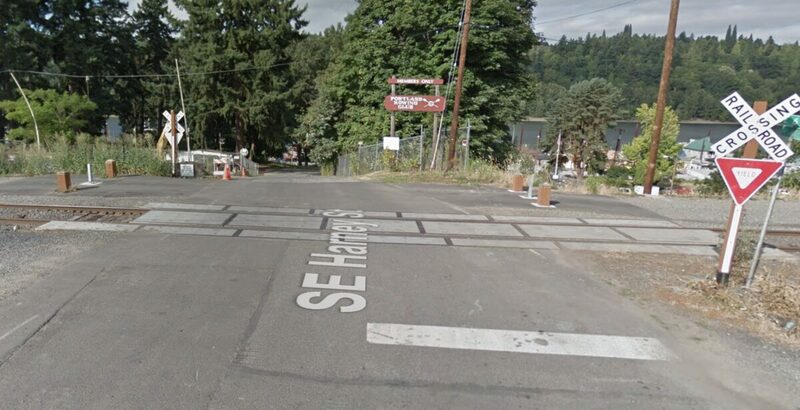 The Portland Parks & Recreation Bureau has started paving a new section of the Springwater Corridor path in Sellwood. This long-awaited project will close one of the last remaining gaps in this important regional path. It’s just a 0.4 mile section of the Springwater between SE Umatilla and 13th; but as any regional trail advocate will tell you, the sum impact is greater than its parts. 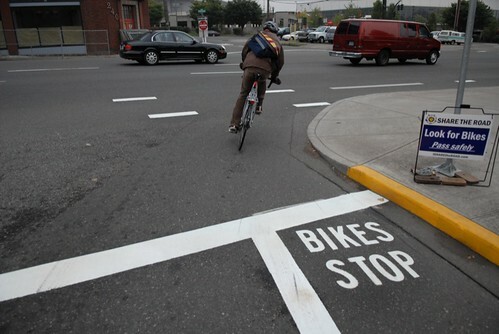 Ask BikePortland: Should I go it alone or with group at stop signs? 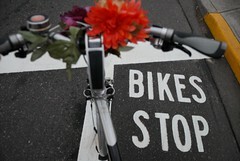 Welcome to the latest installment of Ask BikePortland. Today’s question comes from reader Ruben G. Ruben is curious about a topic on a lot of people’s minds today: stop sign behavior. A woman was handcuffed and placed under arrest this morning after she was stopped for running the stop sign at NE Flint and Broadway when she asked the police officer if she was required to show identification. She was subsequently issued a citation and released. Caruthers at Water, looking west. 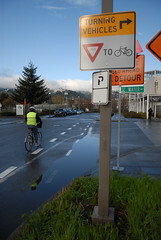 City of Portland crews have removed two stop signs on SE Caruthers Street at the intersection with SE Water. 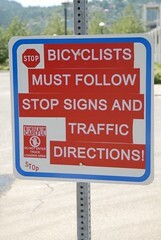 Initially installed in 2002, the stop signs have been a thorn in the side of many people who ride through the intersection and a source of frustration and complaints by others who say no one obeyed them. The Portland Police Bureau sent three motorcycle cops to SE Clinton Street this morning to observe and enforce stop sign compliance at 34th and 21st Avenues. 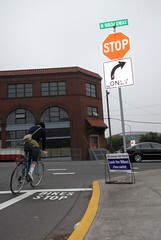 Two stop signs at the intersection of SE Water Ave and SE Caruthers St. in Southeast Portland (map) will be removed by PDOT. 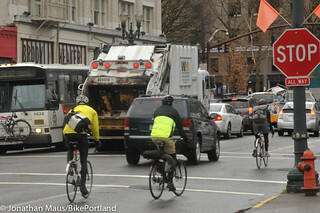 As bike ridership spikes in cities across the state, Oregon’s upcoming legislative session is sure to be full of bike-related action. 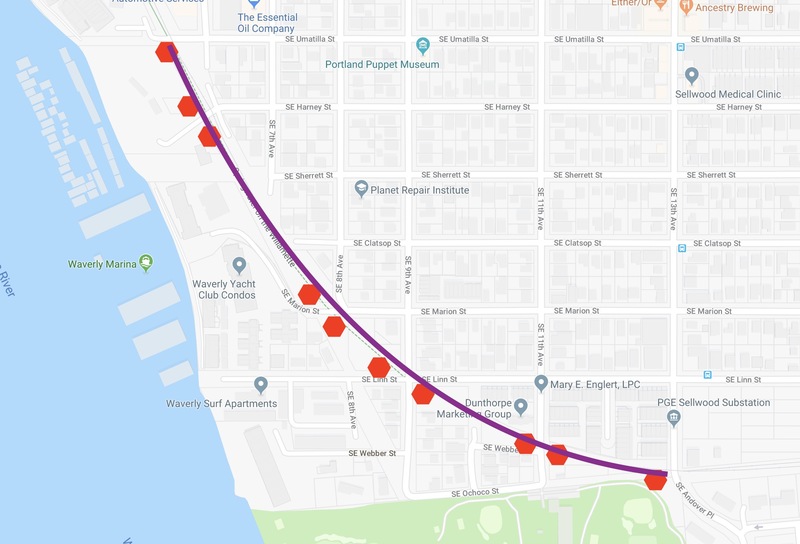 Figuring prominently in that mix will be the lobbying efforts of the Portland-based Bicycle Transportation Alliance (BTA).